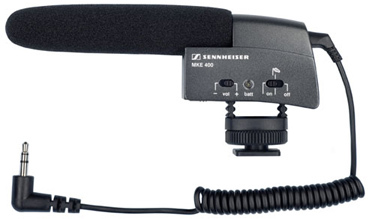 TheSennheiser MKE 400 Compact Shotgun Microphone is a professional audio solution for handheld consumer video cameras and larger video cameras alike. The integrated shockmount conveniently mounts the MKE 400 onto any camera accessory shoe while effectively suppressing handling and vibration noise. Switchable sensitivity aids in capturing long and short distances, resulting in pristine detailed audio and low noise. Additional features include all metal construction and up to 300 hours of operation on a single AAA alkaline battery. The MKE 400 offers a simple solution to achieving high quality audio and is well suited for consumer and professional video applications. Switchable Sensitivity The MKE 400 features switchable sensitivity for optimum results when capturing long and short distances. The all metal construction provides a durable, rugged frame for rigorous professional and consumer operation. For a more detailed product description, including additional specifications, please visit the manufacturer's website.